4 x 10 High Output American Cherry Flush Mount Register Discounts Apply ! These register covers are unfinished allowing you to stain them to match your American cherry floor. 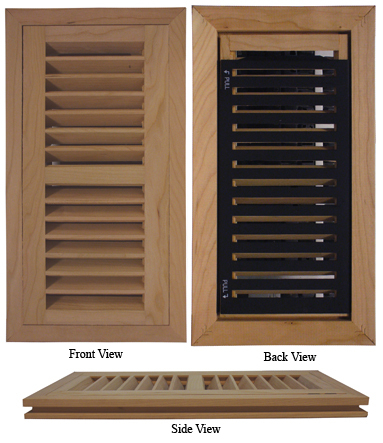 Our flush mount wooden floor vents must be installed along with the floor. The high output design of these register covers will allow for 30% more air flow than standard wooden registers. Wooden floor vents come with a sliding steel damper to easily control air flow. Furthermore, these register covers are made in the USA ensuring high quality workmanship. *Flush mount vents in 5/8" or 1/2" thickness can be special ordered. Call for pricing and availability. ***Hint: When ordering wooden floor vents the industry standard is to order using the hole size. You will need to order the register cover closest to the size hole in your floor. You must install these wooden floor vents at the same time as your floors. Find flush mount register covers in more types of wood and sizes. Looking for wooden floor vents for a pre-existing floor? Check out our drop-in wood registers. Flush mount register covers are a beautiful accent for new American cherry hardwood floors. Order yours today!